We get very excited when it snows. We love it. Almost as excited as when we receive a new fantastic product. When we have the two together, it’s a feast. 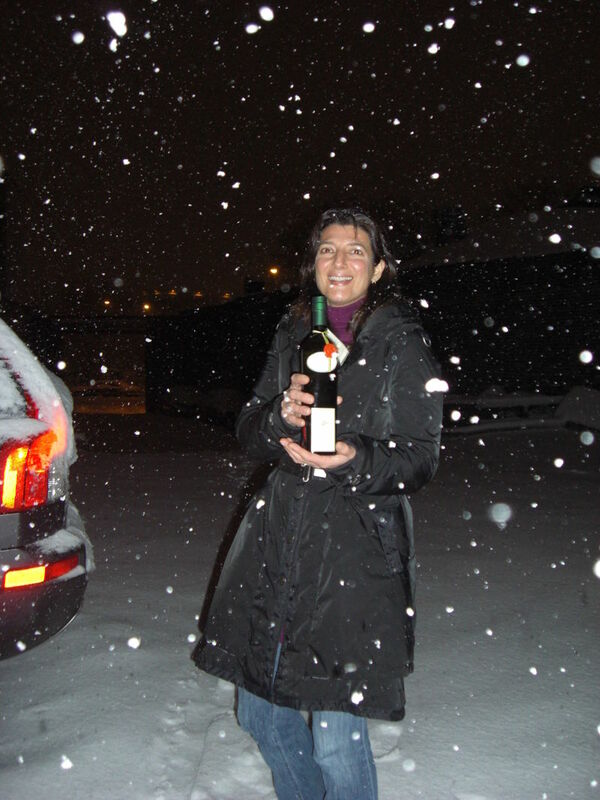 This is Martina, in the snow, holding a bottle of the new harvest of Tratturello. BTW, Tony Mantuano of Spiaggia in Chicago received bottle Tratturello #1 and promises he’ll try to give it to Obama when he sees him. Now, the Obamas have moved to DC to get ready for the inauguration. Will he and Michelle go back to Spiaggia to celebrate Valentine’s Day? Tony will give them our gift then. Care to read the Obama/Tratturello story? Click here. Previous Post If It Is Cheap, It Is Fake. Buy Olive Oil only from Trusted Vendors.